In the Summer of 2018, we shared the news that Family Equality Council and COLAGE would be joining forces, and we’re excited to share this update on our progress toward merging our operations and programming. Earlier this year, Kaley Fry, COLAGE’s lead national staff-person formally joined the Family Equality team as Director of COLAGE Programming, and we added Amanda Barry-Moilanen to the team as the 2019 COLAGE Marketing and Programming Fellow. We also welcomed COLAGE Board Chair Jamie Bergeron as a member of the Family Equality Council Board of Directors. With COLAGE operating as a program of Family Equality Council and with the formal merger process moving ahead smoothly, we’re all looking forward to being together again in person at Family Week 2019! This will be our 25th Family Week gathering in Provincetown, and we couldn’t be more excited to be marking this anniversary by strengthening and expanding COLAGE programming. 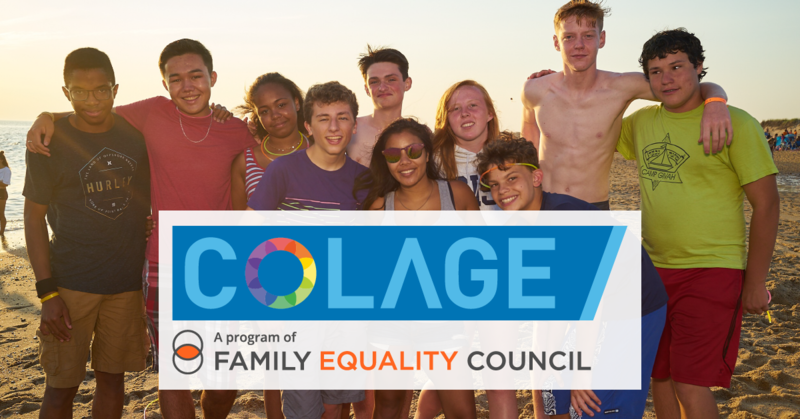 We see COLAGE programs as a critical component of delivering on Family Equality Council’s mission of supporting everyone who is part of an LGBTQ+ family. As always, if you have questions about the merger process and the future of COLAGE programming as a part of Family Equality Council, please don’t hesitate to contact us.